Waikiki is world famous because it was the playground for kings, movie stars, an oasis of beach, palmtrees and beauties with the majestic Diamond Head for a backdrop. Many people dream of coming to Waikiki...they save up for years...plan that fantasy honeymoon...the perfect Hawaiian vacation and finally they are here. So what do you do once you get to this strip of land 6 blocks long? Where are the best places stay? What are the top things to do? Where are the most excellant places to eat? Waikiki is more than just mai tai's and palmtrees. Let us help you explore this wonderful gem of the Pacific. Here's our insider GUIDE to the top ten things to do in Waikiki. Don't miss one of our amazing sunsets. Start off your evenings by walking down Waikiki Beach at sunset. Start at Kuhio Beach towards the Hilton Hawaiian Village. Get gorgeous views of Waikiki and Diamond Head on an exhilirating cruise on a catamaran. With the salt breeze in your face, a mai tai in your hand and Hawaiian music playing in the background this is one water adventure that is a must do on your trip. Enjoy cocktails at sunset and listen to Hawaiian music at House without a Key at the Halekulani Hotel. This timeless tradition is enhanced by two former Miss Hawaii's, Kanoe Miller and Debbie Nakanelua, complimenting the music with their graceful and traditional hula. 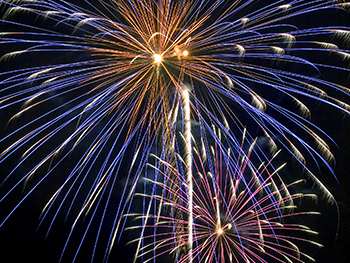 Don't miss the Friday night fireworks show in front of the Hilton Hawaiian Village. It starts off around 8 pm. You can even take a sail on a catamaran and catch the show from the waters off Waikiki Beach. Sunbathe, snorkel and watch surfers on one of the most famous beaches in the world. Start your beach day off with a trip to an ABC Store. Pickup a mat, some drinks and some fresh fruit. Rent an umbrella from one of the vendors on the beach and laze the day. Don't forget your sunscreen! Hawaii's most famous landmark, got its name from early sailors of the late 1700s who mistakenly thought that the glistening calcite crystals inside the tuff rocks were diamonds. Bring a bottle of water and wear appropriate footwear. The views are incredible.